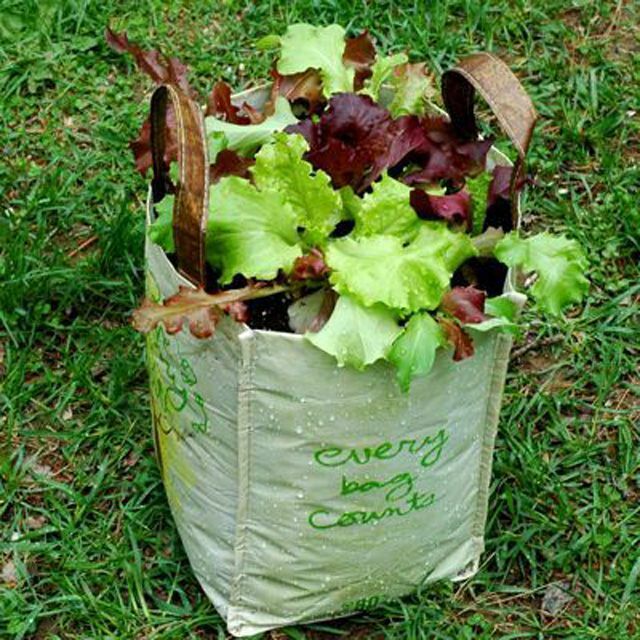 It's easy to grow lettuce in plastic, reusable lunch bags, which can be purchased at most markets for a dollar or so. You could also grow flowers, herbs or many other container garden vegetables, equally successfully in any plastic, reusable grocery bag. Lettuce is a great container gardening vegetable because its short roots mean it can grow anywhere that has good drainage―even a shallow container. However, lettuce likes to be kept moist, and it is easier to keep your plants moist in a larger container that holds more soil, so realize that the smaller the container, the more you will need to water the plants. You can grow lettuce from seed or buy seedlings, which are usually inexpensive. Start with a sunny spot, but one that isn’t too hot. Most lettuce likes cooler temperatures, although you can find some varieties that are somewhat heat-tolerant (Black Seeded Simpson, Simpson Elite, Green Star or Tropicana, to name a few). The first step is to cut holes in the bottom of your bag. Don’t be shy―cut a bunch. Drainage is key because you want to keep your soil moist but not wet. If you're using screening (which keeps your soil in and lets the water out), now's the time to add it. To measure the screen, put the bag on top of the screening and then cut around the bottom of the bag to get a piece of screen that will fit into the bottom of the bag. It doesn’t have to be exact―just big enough to cover the holes. You can also use newspaper or coffee filters to cover the holes. Add potting soil to your vegetable container garden until it is about an inch from the top of the bag. Pick the bag up by the handles and gently tap the bottom on the ground a few times, to help settle the soil. Add more soil if you need to. Consider using an organic potting soil that doesn’t have fertilizer already mixed in so you can manage the supplements yourself. If your potting soil doesn’t have fertilizer already added, you should mix in the amount of fertilizer specified on the label. A slow release organic fertilizer is an easy option because you have more latitude on how much to add. You don’t have to worry about burning your plants, which some chemical fertilizers will do if you mix in too much. You'll need to separate your plant seedlings. Many container garden plants come in a plastic four or six-pack of cells, and sometimes it can be a bit tricky to get the plants out without damaging them. Try turning the whole thing over and then gently squeezing or pressing the bottom and sides of each cell until the plants slide out. If you have to pull, don’t pull on the plant, which is delicate; instead, grab the soil plug and pull that. If your lettuce is root bound, gently tear the roots apart to prevent the roots growing in a circle and eventually strangling your plant. Dig a hole in your potting soil deep enough to allow the seeding to sit at the same level as in its nursery pot, cell or flat. Don't plant too deeply. Continue to fill the bag with the rest of your plants. Because lettuce has a quick growing season, you can plant lettuce seedlings fairly close together. This not only provides you with more lettuce, but it also makes the container look full and bountiful. Harvest the lettuce by picking off the outside leaves, which keeps the container garden from getting too crowded. Water generously, with your hose on gentle spray, or use a watering can with a rose attachment. Keep watering until the water runs out the bottom of the bag. How often you should water it depends on the kind of potting soil you used, and how dry and hot the weather is. If it's windy, your plants will also dry out more quickly. As with almost any container garden, check the soil at least once a day, to see how moist it is. To check, stick your finger up to the second knuckle. If the soil is dry at your fingertip, water your plants until the water begins to run out of the bottom of the bag. It is better to give plants a good soaking less often than to give them frequent sips. To care for your lettuce plants, make sure that they don’t get too hot, and keep the soil moist. Feed lettuce regularly with a liquid, high-nitrogen fertilizer, such as diluted fish emulsion or compost tea (though if you are using compost tea, make sure it's aerated, or there is some risk of spreading E. Coli bacteria). How you harvest lettuce depends on the type you have planted. You can pick the leaves of leaf lettuce from the outside, letting the inside leaves continue to grow. You can also cut off the whole plant, about an inch above the soil and let it re-grow. For lettuce that grows in heads, you usually will pull up the whole head. Is It Safe to Grow Vegetables in Tire Gardens?